Liberal health-care negligence: Where do we go from here? “Sudbury Regional Hospital’s board of directors will hold an emergency meeting today to discuss an action plan to address the city’s bed crisis. The board scheduled the special meeting so it could reply to doctors who work in the hospital system before Dec. 1. More than 250 physicians have hospital privileges, and they have spoken out in anger and frustration about how the bed crunch is affecting their work with patients. It has forced the cancellation of hundreds of surgeries, jammed up the emergency department and added pressure to daily operations throughout the hospital system. At the Nov. 11 meeting of the hospital board, directors supported 15 recommendations from doctors about how the bed crisis could be improved. Doctors warned they were concerned about patient safety because of the situation. The doctors also told the board it was giving it until Dec. 1 to find solutions to the crisis — when the next meeting of the medical staff will be held. The doctors’ group was asking for immediate funding for 24 transitional care beds at the hospital, and Sudbury MPP Rick Bartolucci announced funding for that last week. But there are several other recommendations from doctors, including funding 96 beds at the hospital’s Memorial site to treat elderly and infirm patients after the new one-site hospital opens in the spring of 2010. Hartman said directors know what the solutions are to the crisis. This meeting is designed to move closer to implementing them. The medical staff will meet Monday evening to hear a progress report from the nine-member physicians’ task force, struck early in November in response to the crisis. They have been investigating their own solutions. Whaaa …..? Find ways in which the province’s Liberal-government assholes can help? Are you kidding: Ontario Liberals are the FLICKING PROBLEM! You need a Liberal MPP to “help” you like you need a hole in the head, for crying out loud. Where indeed “do we go from here”, when big-central-government Liberals negligently cut health-care for our own good? Here in Niagara we are experiencing the same problems and being given the same tired statist Liberal "solutions" - government health-care cuts to 'save' government health-care! This trend did not go unnoticed; Ontario Auditor Jim McCarter’s Dec. 2007 report (see: Ontario Liberals can't measure hospital surgical capacity) noted numerous systemic deficiencies with McGuinty’s health monopoly. McGuinty ignored calls to investigate the C. difficile outbreak in his government-run health monopoly, which killed over 500 Ontario patients (that we know of). McGuinty ignored calls for Ontario's ombudsman to investigate the Niagara Health System, whose St. Catharines hospital was found in a Nov.29, 2007 CIHI report to have the third-highest patient death-rate in Canada. St. Catharines Liberal health-care monopolist MPP Jim Bradley refused to provide any explanation for his local health system’s high death-rate. CIHI’s St. Catharines patient death-rate revelation remains unexplained to this day. The ombudsman's study of the Suzanne Aucoin case, I believe, was indicative of the kind of systemic problems found within Ontario's health monopoly. I believe further investigation is needed to determine whether patient health had been (or still is) placed at risk by political fiat of a government-run health monopoly, while concurrently that same government bans patients from accessing other non-state-controlled health-care options. The Ontario government is clearly forcing its health-systems to cut costs; yet, the government also prevents any independent scrutiny of its hospitals to determine the efficacy of its policies and the veracity of its claims as to their impact on patient health. In the case of the NHS, the government has said there is no link between their funding-model and patient-care (see: Liberals ignore call for health-monopoly investigation); in fact, previous Liberal Health Minister George Smitherman said hospitals were in a spending "free for all" (see: Liberals claim medicare is a "free-for-all": so they cut hospital beds and nurses! ) and that they must essentially work within the budget rationed them by the Liberal sole-single-payer government; yet the NHS says, in contradiction, that they need more funding to operate and maintain service levels. An investigation by some independent authority is needed; whether of the LHIN, or of the NHS itself, to see how far up McGuinty's government the rot lies. I believe such oversight should be mandatory and permanent for the entire MUSH sector, especially in areas where the government assumes a monopoly. Arrogant, secretive Liberals hide from that kind of scrutiny and accountability, while patients suffer in the Liberal's health-care monopoly morass. So, where does a citizen go from here? The States? 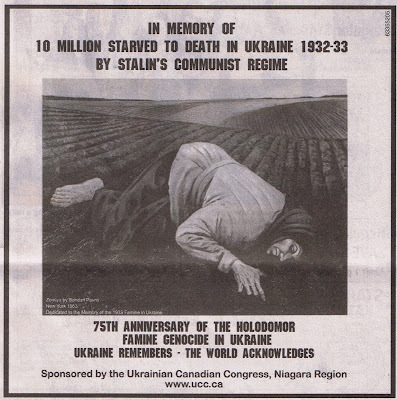 The above ad commemorating the 75th anniversary of the Ukrainian Holodomor appeared in the Nov.28, 2008 St. Catharines Standard. "My best known work is entitled "Zemliia" (Earth), it is dedicated to the memory of the 1933 famine in Ukraine, and based on a landscape clip from Oleksander Dovzhenko's film on the same subject. This painting is now part of the collection of the Ukrainian Orthodox Community Museum in South Bound Brook, N.J."
“The details of suffering through years of food shortages and witnessing outright starvation do not make for children's stories, so for years Ivan Glasko, who lived through such misery, avoided telling them. Glasko was born in 1923 in a Ukrainian settlement near the Caucus mountains in south-western Russia. While still a young child, he and his family endured what is now called one of the worst crimes against humanity of the 20th century, the Holodomor-famine genocide of 1932-33. The famine, and other famines which affected other Soviet satellites around the same time, was the direct result of government actions to confiscate agricultural harvests, and led to the deaths of millions. Though Glasko's daughter, Maria, knew that her father lived through the famine, it was only in her 20s and 30s that she learned the scope of what he went through. She recalls one conversation which occurred about a year ago after the airing of a television campaign to assist starving children in Africa. Pointing to images of children with extended bellies and twig-like limbs, her father told her that was exactly what he looked like at one time. "When he told me that, it just stopped me in my tracks," she said. "I was shocked." Glasko's family were wealthy farmers, the type of people targeted by Soviet authorities. In 1929, when he was only six, Glasko, along with his mother, five-year-old sister and three-year-old brother, were sent to a Siberian village, which had been emptied of residents and turned into a prison work camp. There until 1933, Glasko had to look after his younger siblings while his mother was sent out to work in the bush. "Nobody attended to us," he said. "Nobody looked after us. We just waited." And hungered. With no food in the house, the children had to wait for their mother to bring food rationed to her, so she could work. "She saved it for us," he said. When that wasn't enough, they improvised, eating wild berries and grasses in the summer and hunting "anything that crawled" in the colder months. Sometimes, his mother would send him out to collect horse manure to separate and wash the undigested barley, so she could make soup. Their father, after he found them, arranged for their return in 1933, and for the years leading up to the Second World War, they settled in a village near their hometown. Though records show the famine ended in 1933, times were still tough for the next three years and there were still food shortages. This year marks the 75th anniversary of the Holodomor-famine genocide of 1932-33. To mark the date, there will be a commemorative program Sunday afternoon at the Ukrainian Black Sea Hall. It begins with a prayer service, after which survivors will hold memorial candles. Afterwards, there will be a documentary shown about the famine. The program begins 2:30 p.m. at the hall, located at 455 Welland Ave.
“Thank you for the recent piece entitled: ‘Survivor recalls living through man-made famine’. I read the story to my grandmother who also lived through that experience. Her family was part of a rather large minority group living in Ukraine, called the Germans from Russia. She was only five years old at the time when Stalin ordered the harvests to be confiscated. I asked my grandmother how well she remembered the famine and she replied, “You can’t forget a thing like that.” She told me that their family survived partly due to her grandmother, who rationed the family’s meager food supply (they lived on a “soup” made of hot water, a little flour and a few beans). Not an easy time by any stretch of the imagination. And that was really only the beginning of their troubles living under Stalin’s rule. My grandmother saw both her father and grandfather taken away to prison in the late 1930’s and early 40’s. Her grandfather’s crime? Speaking the Lord’s Prayer at a gravesite. I’ve been engrossed in these histories for the past year or so. We are actually making an independent feature film based on the life of that grandfather. While the film is not about the famine per se, it is about the culture of fear and persecution set up by the Stalinist regime. And it makes me think… We really do have it good here in Canada. I wish Munoz well with her film and famine documentary projects. “Today at Westminster Cathedral in London, England, two journalists will receive the Ukrainian Order of Freedom. Both men are dead. What did they do to deserve this posthumous honour? They told the truth when all around them their press colleagues were inadvertently (or, in one case, deliberately) misleading the public. Gareth Jones was born in Wales in 1905. He worked as a reporter for several papers before travelling through Russia and Ukraine-- where his mother had lived--in 1932. Jones found people starving everywhere he went, and he wrote about it. The Western press corps, mostly confined to Moscow, was manipulated by the Communist authorities into believing that all was well, and they rejected Jones's reports. As the world now knows (although it took more than half a century and the opening of Soviet archives to confirm), approximately 10 million people were deliberately starved to death by the collectivization policies pursued by Joseph Stalin. Malcolm Muggeridge was a largely unknown journalist when in 1932 he went to Moscow as a stand-in correspondent for the Manchester Guardian. By this time, Stalin's twin manias -- collectivization of agriculture and dekulakization of peasants -- were at their bloodthirsty zenith, but few knew this because of the sycophantic foreign reporting. The Moscow press corps was then led by Walter Duranty of The New York Times. For two decades, Duranty had been the most influential foreign correspondent in Russia. His dispatches were regarded as authoritative; indeed, Duranty had helped to shape U. S. foreign policy. His biographer has demonstrated that Duranty's reporting was a critical factor in FDR's 1933 decision to grant official recognition to the Soviet Union. When the Pulitzer Prize committee conferred its prize on Duranty (in 1932, at the height of the famine), they cited his "scholarship, profundity, impartiality, sound judgment and exceptional clarity." Duranty, an unattractive, oversexed little man with a wooden leg, falsified facts, spread lies and half-truths, invented occurrences that never happened and turned a blind eye to Stalin's man-made famine. When snippets of the truth began to leak out, Duranty coined the phrase "You can't make an omelette without breaking eggs" -- meaning that the supposed benefit of communism justified the cruelty meted out by Stalin and his minions. This phrase, or a variant thereof, has since proved useful to a variety of tyrants and ideologues who contend that a worthy end justifies base means. Meanwhile, in the spring of 1933, young Malcolm Muggeridge did an audacious thing; without permission, he acquired rail tickets and set off on a train journey through what had formerly been the breadbasket of the Soviet Union: Ukraine and North Caucuses. What Muggeridge witnessed, he never forgot. In a series of articles smuggled out in the diplomatic pouch, he described a man-made famine that had become a holocaust: peasants, millions of them, dying like famished cattle, sometimes within sight of full granaries, guarded by the army and police. At a German co-operative farm, an oasis of prosperity in the collectivized wilderness, he saw peasants kneeling down in the snow, begging for a crust of bread. In his diary, Muggeridge wrote: "Whatever else I may do or think in the future, I must never pretend that I haven't seen this. Ideas will come and go; but this is more than an idea. It is peasants kneeling down in the snow and asking for bread. Something that I have seen and understood." Few believed him. Muggeridge's dispatches were cut. He was sacked by the Guardian and forced out of Russia. He was vilified, slandered and abused. Walter Duranty's voice led the chorus of denunciation and denial, although privately Duranty told a British foreign office acquaintance that at least 10 million people had been starved to death -- adding, characteristically, "but they're only Russians." Beatrice Webb -- Muggeridge's aunt by marriage, and a longtime Soviet apologist -- said that Muggeridge's famine reports were "base lies." The very Reverend Hewlett Johnson, Anglican Dean of Canterbury Cathedral, from the pulpit praised Joseph Stalin's "steady purpose and kindly generosity." George Bernard Shaw made a whirlwind tour of Russia and pronounced himself satisfied that there was ample food for all in the worker's paradise. Vindication for both Jones and Muggeridge was a long time coming. In 1990, Walter Duranty's biographer, Susan Taylor, wrote: "But for Muggeridge's eyewitness accounts of the famine in the spring of 1933 and his stubborn chronicle of the event, the effects of the crime upon those who suffered might well have remained as hidden from scrutiny as its perpetrators intended." Today, 75 years later, vindication is complete, as Gareth Jones and Malcolm Muggeridge posthumously receive the Ukrainian Order of Freedom. If there is a comparable Award for journalistic integrity, they deserve that too." "
“Re: Telling The Truth About The Ukrainian Famine, Ian Hunter, Nov. 22. Ian Hunter accuses Joseph Stalin of the "crime" of creating a famine in Ukraine. So was the famine illegal? The Irish famine of the mid-19th century resulted in enormous numbers of deaths, mass peasant evictions and desperate emigration in coffin ships. This cut Ireland's population in half in only 10 years. And it occurred in the backyard of the richest, most powerful, most advanced and most civilized empire the world had known. But it was all perfectly legal. Why, sure, … it was 'all legal' – to a Stalinist. Were Irish farmers forced to hand over their harvest to the government at gunpoint? “Re: A Tale Of Two Famines, letter to the editor, Nov. 25. Letter-writer Denis Walsh argues that the 19th-century U. K. government was as blameworthy for the Irish potato famine as was Stalin for the Ukrainian famine of the 20th century. The principal difference between the two, of course, is that the Irish famine was precipitated by a fungal disease and the Ukrainian famine by government fiat. “The Ukrainian community of Sudbury united at Tom Davies Square Saturday afternoon to commemorate a devastating time in its cultural history: 75 years ago a genocide by starvation wiped out as many as 10 million Ukrainian men, women and children. Between January 1932 and July 1933, countless people starved to death during a man-made famine. The Holodomor, or hunger plague, was a famine engineered by the Soviet Union, under Joseph Stalin — a communist dictator — as part of a series of actions, including mass executions, designed to destroy the Ukrainian nation, according to holodomor.org.uk. The government confiscated all agricultural food sources, including grains and livestock. Massive amounts of grain were sold to foreign markets to build factories and provide weapons for the military, leaving the Ukrainian villages barren and hungry. The Ukrainians were also kept from leaving their homes. 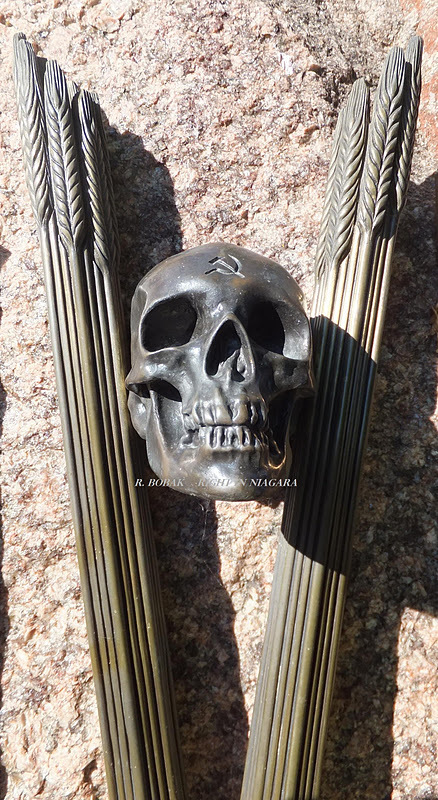 For years, the Holodomor went unrecognized as an act of genocide, and the mere existence of the famine was repeatedly denied by the Soviet governments. On Saturday, the League of Ukrainian Canadians, in partnership with the League of Ukrainian Canadian Women, joined in a ceremony being held in countries across the world, to pay tribute to those whose lives were lost and to bring awareness to a topic that has been long swept under the rug. “The Holodomor was a very tragic period of time. I still can't talk about this without getting choked up,” said Steve Ostafichuk, president of the Oshawa branch of the League of Ukrainians, and keynote speaker for the ceremony. He stressed the importance of spreading the word about the famine-genocide, to recognize it happened and to prevent it from ever happening again. “Anything we can get into future generations about what genocide is all about, gives us an opportunity to hopefully evolve humans into a better class of humans so that we might actually live up to the term humanity, which is something we fall short of these days,” Ostafichuk said. Orest Staneckyj, a member of the league of Ukrainian-Canadians in Sudbury, said the genocide has become a matter of education, and getting the word out that it happened. “The famine-genocide in Ukraine was the direct result of the Soviet policy that crushed the nationally-conscious Ukrainian people,” he said. “In the early 1930s, the very part of Europe, in a region considered to be the Soviet Union's bread basket, established a communist regime and committed a horrendous act of genocide against millions of Ukrainians. Last spring, Canada was one of the first countries to recognize the Ukrainian Famine as an act of genocide. In May, the government passed a motion to establish a Holodomor Memorial Day, to be held on the fourth Saturday of every November. It wasn't until November 2007 that the Ukrainian Parliament passed a bill branding the Holodomor an act of genocide against the Ukrainian people as well. As part of the commemoration ceremony, a travelling exhibit was displayed in Tom Davies Square, including 101 posters covering every aspect of the Holodomor. Ostafichuk is largely responsible for the ever-growing reach of the exhibition — there are now 250 exhibitions booked around the world, in schools, churches and city halls. When he first came across the exhibition in Toronto, the first generation Ukrainian-Canadian said his ignorance of his own heritage made him mad. “I thought I was well-educated, only to see all this information about the Holodomor that I knew little or nothing about,” he said. “I resolved to make sure this became an education program so people like myself in Canada, ... would know what happened to our own people. No official from Dalton McGuinty’s Liberal Ontario government has yet explained the reasons behind CIHI's findings. Bradley couldn’t even bother himself to call for an investigation into the high-death-rate revelation in his own Liberal government-monopoly-run hospital. The Liberals pretend there is nothing wrong with their health care monopoly, or with their government-run single-payer health-care funding model, or with their government-allotted health-care rationing. The unaccountable, arrogant Liberals have also denied access for any independent scrutiny of their government-controlled-monopoly hospitals. They are shielding themselves from any attempt to uncover the systemic extent of their culpability regarding patient harm/death attributable to their Liberal government's monopolistic health care policies. The Liberal cuts continue, despite Liberal Health Minister David Caplan's tiresome rhetorical smears about what he alleges the Conservatives did ten years ago; it's Caplan's Liberals - now - who are today cutting health-care; it's Caplan's system which is killing people; it's Caplan's Liberals who purposefully hide from Ombudsman scrutiny. It's happening throughout Ontario: systemic Liberal health-care cuts; Liberal-caused wait-time increases; Liberal-caused travel time increases; Liberal-caused operating room closures; Liberal-caused health-care reductions; Liberal-caused wait-time increases for cancer surgery; Liberal-caused reduced access to diagnostic tests . . . until "there is only skin left on our bones". All this in the name of Tommy Douglas's socialist ideology? Is this is what American sickos like Michael Moore desire as their model for universal government-run U.S. health care?! What these negligent Liberal assholes are doing to Ontario patients - trapping them in their shrinking, no-patient-choice, Liberal government-run health monopoly - should be viewed as a criminal act. “This is in response to two articles in Saturday's Tribune: "NHS relations unaided by adviser, says Badawey" and "Ombudsman remains mum on health system complaints." Andre Marin, in one of his last acts as Ontario ombudsman, submitted on June 17, 2008, "The Ombudsman of Ontario Annual report for the period of April 1, 2007 to March 31, 2008." It can be found online at www.ombudsman.on.ca/me. With respect to hospitals in Ontario, it is only when the government puts in place a supervisor to oversee operations of a hospital or care facility that the ombudsman has "jurisdiction." We have not given our ombudsmen access to our hospitals as is the case in the rest of the country. What are we trying to avoid or hide? The Ontario government has not followed the lead of the other provinces. Marin, in his report, states from 2002 to 2006, hospital supervisors were appointed four times. But in 2007 alone, there were five takeovers -Stevenson Memorial Hospital, The Scarborough Hospital, Huronia District Hospital, Kingston General Hospital and Brampton William Osler Health Centre. His report refers to issues in Brampton where the community protested against mismanagement and poor service at the newly constructed Brampton Civic Hospital (part of the William Osler Health Centre). This occurred less than two months after the hospital opened its doors. The government arrived with a supervisor to seize control. Something to muse about. Do we do it now or later? You would think the government would have learned by now and moved on this, or do we call local matters Brampton Phase 2. Marin's office received and acted on some complaints about these hospitals and continues to monitor others. He makes an interesting insight about our hospitals: "This is a time-limited, ad hoc cure for a chronic condition of inadequate oversight." Internal ombudsman do not provide independent investigative review or address systemic failings. The Ontario ombudsman has the authority. Do we have a systemic failing? Would the ombudsman's presence help? Why are so many industries and practices under the scrutiny of the government except hospitals in Ontario? Are they better off? Go and ask them. Why should one of the most important institutions, which literally deals with matters of life and death, be left out of the jurisdiction of the ombudsman? As reported in The Tribune on Nov. 6, Tom Closson, president of the Ontario Hospital Association in his keynote speech at HealthAchieve2008, chastised the Niagara politicians for "grandstanding" and for "irresponsible attempts" to block a plan that would lead to better health care. With respect to those "irresponsible" politicians who want to block this plan - I thank you more. We should take the proper action to bring the ombudsman in and resolve this once and for all. This is a systemic failing and it needs to be addressed." Here we have another call in Niagara (following the one I made in 2007 here, which is most likely the first call from anyone in Niagara to do so!) for the Ontario ombudsman to investigate the Liberal's health system: will MPP Jim Bradley's Liberals ignore this one as well? What are Bradley and his Liberals trying to hide, by not allowing the ombudsman's office oversight into the MUSH (municipalities, universities, public schools, hospitals) sector? The Conservatives, the NDP socialists, and the ombudsman's office itself all requested that it be allowed access to independently examine these vats of Liberal pork-barrelling: the McGuinty Liberals refused. "The provincial government immediately rejected Marin’s call for more oversight, pointing to other measures of accountability, at least in the hospital sector. “The level of accountability that hospitals have right now, with the combination of community-based governance, local health-integration networks, and the power of the provincial auditor for investigation — (that) really is a pretty comprehensive regime of accountability,” said Health minister George Smitherman." Good Ole' Smitty - he sounds just like his Gritty compatriot, Good Ole Jimmy Bradley - with the rhetorical Liberal BS bafflegab. "Community-based governance" - on the face of it, aren't we told that this is what the LHIN's supposedly are?? Smitty makes it sound like two separate things. Of course, conveniently left unsaid was that the LHIN's are created, funded, appointed and directed by the McGuinty Regime's Politburo, so, who are they beholden to?! What "level of accountability" was Smitty alluding to - it's a "comprehensive" charade! More specifically, it is typically reprehensible Liberal Healthcare Duplicity. As for the provincial auditor - the Liberals couldn't care less what he comes up with - they'll ignore the auditor just like they did Ontario Auditor Jim McCarter's 2007 critical health-care findings. The question is why should health-care be solely the purview of ideological Liberal monopolists? The answer, sadly, may not even reside with the investigative powers of the ombudsman - the problem is purely political - an ideological, authoritarian Liberal government is imposing its interpretation of Tommy Douglas's failed socialism, callously avoiding scrutiny and transparency in order to falsely propagate an illusion that single-payer, state-run, monopoly-medicare is some kind of Utopian success in Ontario. (click on photo to enlarge) Need further evidence of Liberal secretiveness, of Liberal arrogance, of Liberal unaccountability, of plain ole Liberal Healthcare Duplicity? The headline on Keith Leslie's above report (St. Catharines Standard, Sept.25, 2008) sums it up: "McGuinty rejects demands for probe into C. difficile deaths". It doesn't matter that the McGuinty Liberals were warned and knew for five years that C. dif was infecting their system, nor does it matter that the Liberals haven't revealed how the outbreak started. It doesn't matter that the Liberals 'supported the listeriosis outbreak inquiry after 18 deaths, or called for a SARS inquiry at 44 deaths': that is typical Liberal sanctimonious posturing - blame another party or another level of government whenever politically advantageous, so as to deflect scrutiny on the 500 deaths occurring in your own Liberal health monopoly. It doesn't matter that St. Catharines Liberal MPP, health-monopolist Jim Bradley arrogantly refuses to answer constituent questions, see: Another C. dif outbreak in Ontario: why aren't Liberals held willfully negligent? It doesn't matter that for a year now, Bradley has avoided publicly disclosing why the hospital in his own riding, the St. Catharines General, was found in a Nov.29, 2007 CIHI study to have the third-highest patient mortality rate in Canada. It doesn't matter that a smug Bradley didn't even bother to call for an investigation at the time the report was released. It doesn't matter that the Liberals deny that they are underfunding the hospitals, and deny links between their funding model and the hospital mortality rate. It doesn't matter that the Liberals - at the same time - refuse to allow independent scrutiny of hospital finances, in order to assess and verify the Liberal's claims. It doesn't matter that half of Ontario's Liberal-government-run hospitals are in a deficit - a deficit purposefully created by none other than Liberals themselves. It doesn't matter that the Liberal's hated Health Tax, the biggest single tax-grab in Ontario history, was supposed to - but hasn't - solved the problems inherent in the Liberal's single-payer, state-run health-care ideology. How dare the proletariat demand accountability and answers from their arrogant Liberal MPP's? Looking for more evidence (see also: Second-rate Liberal health-care in Sudbury, Jim Bradley's hometown) of Dalton McGuinty’s mismanagement of his Liberal-run health monopoly? “As the clock ticks, the deadline gets closer for Quinte Health Care to come up with a solution to an $8 million deficit problem. The province has given QHC until March 31, 2010 to permanently eliminate $8 million from its annual budget, which means there will be significant cuts to services, according to Susan Rowe, manager of public affairs and community relations for QHC. She says it is too soon to speculate about possible staff cuts as they are nowhere near saying what the impact will be on individual sites. Rowe says once this reduction in the budget is implemented, QHC must continue to balance the new budget every year or else QHC will become a provincially-owned unit, like Kingston General Hospital, making this budget shortfall more than just a one-time issue. The easiest way to understand why QHC is in this position, Rowe says, is to realize that in the past five years, expenses have gone up at a seven to eight per cent rate compared to a two to three per cent revenue increase from the Ministry of Health and Long Term Care. Wages, benefits, medication and information technology are all expenses that contribute to the overall increase of doing business, Rowe says. All these costs are continuing to rise, some of them at greater than inflation, and certainly at a rate greater than the two to three per cent from the Ministry. The fact that Quinte has a growing population is also a main contributing factor to the problem of cost, Rowe says. The aging population and the fact there is such a high number of patients waiting for beds in nursing homes is directly related to the overall occupancy rate. The Ministry of Health typically budgets a hospital at an 85 per cent occupancy rate, where QHC is currently at a 100 per cent occupancy. Rowe says from a budgeting perspective, that 15 per cent difference is huge. Julie Gunter, a second-year registered practical nurse, says the removal of any of QHC services is going to negatively affect health care because patients may not be offered the proper level of care. However, she does not yet feel her profession is at jeopardy because there will always be a demand for nurses with the aging population. “They will always need RPNs [in health care] because we do hands on care with the patients and are [typically] more affordable [than other health care technicians],” she says. Gunter believes none of the services offered through QHC should be cut because the health center is already struggling to provide the best quality of care to the community but she understands it is now out of their control. She trusts the management at QHC to consider all options and make a conscious and well-educated decision on how best to deal with the deficit. The management team will be creating options that will soon be presented to the board. Once the board has decided on a possible course of action, there will be consultations with the staff, physicians, other health care partners and the public to come up with a final decision to implement the plan. In the above article, you might as well just replace “QHC” with “NHS” – the problems are the same! Liberal monopoly health-systems are being ordered to CUT SERVICES and REDUCE BUDGETS in order to meet Liberal-created, artificial deficit envelopes. When Newland reports: “The aging population and the fact there is such a high number of patients waiting for beds in nursing homes is directly related to the overall occupancy rate. The Ministry of Health typically budgets a hospital at an 85 per cent occupancy rate, where QHC is currently at a 100 per cent occupancy,” this sounds just like in St. Catharines! When Rowe says: “We get a base amount and it doesn’t matter how many patients come through our door in any given year, that is the amount we receive,” – we should ask, is that also what happened in St. Catharines, prior to the Nov.29, 2007 CIHI discovery showing the St. Catharines General Hospital had the third-highest patient death-rate in Canada? Were the Liberals handing an aging and rising population a fixed amount of dollars to be rationed on a declining per-patient basis?? This apparently is the “status-quo”, the standard-operating-procedure norm in McGuinty’s authoritarian health-monopoly: under-funding their own system, while concurrently - and purposefully, by law - denying patient-hostages the option to obtain competitive payer/provider health care. This is demogogic Liberal ideology run amok; this kind of Tommy-Douglas-socialism-taken-to-the-extreme horror story should be considered nothing short of criminal. Secretive St. Catharines Liberal MPP Jim Bradley has still not explained what led up to the high mortality-rate in the hospital in his own backyard. Yet, Ontario Liberals baldly claim that they ARE NOT (!) underfunding hospitals; they claim there is no link between the death-rate and their funding formula, but, they also refuse to allow the ombudsman to investigate their health monopoly. MPP Jim Bradley didn’t even bother to call for any investigation into the Niagara Health System (NHS) after the high mortality-rate was revealed. What Niagarans got were consolidations by the NHS, after a drawn-out ‘review’ (the Jack Kitts report of Oct. 2008) which only rubber-stamped the Liberal's grand plans of 'fixing health care by cutting health care', and, at the same time, preventing Ontario's patient-hostages from seeking their own, non-state-supplied health-care.
" More than half Ontario's 157 hospitals have projected deficits for the end of the 2009-10 fiscal year and the trick will be to "minimize harm" to the health-care system as cuts are made, says Tom Closson. The president of the Ontario Hospital Association said Thursday that due to several factors -- but most importantly the economic downturn -- hospitals are going to have to cut and consolidate services. "It is a challenging time for health care at the moment because of the (economic) situation," Closson said. Quinte Health Care will have an accumulated projected deficit of about $15.3-million by March 31, 2010. Part of that can be laid at the feet of capacity -- its sites, particularly Belleville, Trenton and Picton, have beds taken up by so-called alternate level of care patients. Those are patients who are ready for discharge from hospital but have nowhere to go because of a lack of available nursing home beds and in-home nursing services. Closson said that at any given time 30 per cent of beds are taken at QHC by these patients (the figure fluctuates), whereas the provincial average is 20 per cent. The situation has forced QHC to pay nurses overtime and stress on nurses has resulted in more sick time, driving up costs. Nursing homes and in-home services would be cheaper and a more efficient use of scarce health-care dollars than keeping them in hospital. "We could use the money more wisely," Closson said. The province's 14 Local Health Integration Networks, which took over responsibility for health-care funding from the Ministry of Health, are working with the OHA to see what can be done to help hospitals secure balanced budgets, he said. "We are doing a review of each hospital at the moment," Closson said. Also causing financial grief is funding levels, he said. Hospitals received an across-the- board increase of 2.4 per cent for 2008-09, and expect a 2.1 per cent in 2009-10. "Inflation is obviously higher than that," Closson said. But the big question mark remains the economic downturn that has struck the province, he said. It could mean funding levels to hospitals will be reduced even further. Again, eerily similar to Niagara - Liberal MPP’s either don’t know what their own government is doing about the funding levels, or aren’t giving the answers – and they're the ones running the health monopoly. Half of Ontario's 157 hospitals are in deficit, yet Liberals claim their underfunding has nothing to do with that? What a load of Liberal Healthcare Duplicity. Let’s not forget that Niagara’s so-called “review” process slowly began late in 2007, before the excuse of the “economic downturn” was taken seriously by the Liberals in the first place. The Liberals were already underfunding their health monopoly prior to this excuse being used. That was over two years ago: this statist assault on health-care by monopolist Liberals has been deliberate. As detailed in the next article (below) the Quinte Health Centre is now also looking for a “reviewer”. How coincidental … Dr. Jack Kitts just finished up the Liberal’s dog-and-pony show here in St. Catharines for the NHS, sooo ... maybe he's available? Also coincidental (!) is that the so-called reviewer (rubber-stamper?) that the QHC is seeking WILL NOT be looking at the QHC's finances ... just as NHS reviewer Dr. Jack Kitts did not do! Financial examination is purposefully left out of their purview. The Liberals don't want anyone snooping around their monopoly's hospitals asking questions that go to the heart of their political, not medical, policy; or discovering links or discrepancies between the Liberal's funding decisions and resultant medical care! “An independent reviewer will look at plans to mop up the red ink at Quinte Health Care. But, if mayors and QHC officials thought they'd get some hint of financial help from a meeting with the province's health minister Thursday, they left empty-handed. Following a meeting between QHC officials, local mayors and Health Minister David Caplan in Toronto, little has changed -- the hospital still faces major service cuts and a ballooning deficit. The reviewer -- known as a "third party" overseer "agreed upon by all parties" at the meeting Thursday -- will not look at QHC's finances, just the options drawn up by administration to cut expenses. Those expenses could include cutting services at any of QHC's hospitals, but most likely at Trenton and Picton. It is expected the reviewer, who has yet to be chosen, will begin his or her work in April 2009. But, Caplan made it clear to QHC board members there would be no new money to help overcome financial woes. "Did we get more money? No," said Belleville Mayor Neil Ellis in an interview after the hour-plus long meeting with Caplan. "Do we still need to balance our budget? Yes." As well, QHC still has a Dec. 21 deadline to produce a plan that will detail how the hospital will ensure that it has a balanced budget at the end of two years, by March 31, 2010. Officials from QHC and the regional body that controls health-care funding in this area -- the Local Health Integration Network -- will meet Monday to sort out the details on a reviewer. The new development means that a special QHC board meeting set for Monday is cancelled, officials said. Prince Edward County Mayor Leo Finnegan said the meeting with Caplan was "positive." "No, we didn't get any money (but) the door wasn't slammed and we weren't told to go home," he said. Laughton is on record as saying the cuts could be "heart-wrenching." Prince Edward-Hastings MPP Leona Dombrowsky, who helped arrange and attended the session with Caplan, said there was a "fair airing of the issues." She said the minister gave no direction on how to eliminate the deficit, but reminded everyone there was an ultimate goal in mind. "That is about providing quality health care ... in a sustainable way," Dombrowsky said. According to the minister, the other goal was to uncover "how did (QHC) get from a balanced position" to a deficit, she said. To be clear, QHC has a projected deficit of $6.8 million in 2008-09, and another $8.5 million by March 31, 2010, said QHC spokeswoman Susan Rowe. That totals $15.3 million -- the figures tend to change as the days roll by and projected numbers become more concrete. The hospital will borrow the $15.3 million from a bank and will pay off the debt over a long period of years, she said. The financial plan to be filed by QHC to the LHIN by Dec. 21 will detail how the hospital will move forward, beginning April 1, 2010, with a balanced budget. The hospital will still hold a series of public meetings to gather opinions from residents on which cuts are the most palatable. "When this review process is complete, we will share the restructuring options with the board and our communities and solicit other options and ideas from them," QHC board chairman Jack Moore said. In an interview after the meeting, Caplan said he was pleased QHC was going to "engage" residents before making any decisions on cuts. He added he told the LHINs, who must approve any proposed cuts by hospitals, that non-clinical areas should go under the knife first and that nurses should not be laid off. "I made that very clear ..." Caplan said. Delivering health care at a cost society can afford is a hurdle regardless of the economic times, he said. A faulty ideology has infected both of these health-monopolist health ministers, as well as Ontario's Liberal lemming MPP's – they believe that they alone should be providing health care! Yet, even though they KNOW they 'can’t do it all'; even though they KNOW they 'can’t provide the resources to properly fund their monopoly' - they still deny patient-consumers the right to obtain their health care elsewhere. Let's move forward to Chris Malette's Nov.21, 2015 Inside Belleville Metroland Media report about health-care cuts being implemented in Belleville - the QHC "admitted that the news was difficult to announce. The restructuring is intended to allow QHC to remove $11.5 million in expenses next year in order to operate within its reduced funding levels from the province. This includes a $7-million reduction in administration/support departments and $4.5 million in patient care areas, QHC said"
This is the EXACT same duplicitous health care cutting template, which the Liberals did in Niagara! Liberal healthcare hack Hoskins is doing the same things that Smitherman, Caplan, and Matthews did before him. The healthcare budget IS SET at the whim of health minister Eric Hoskins' monopolist Liberals - therefore, cuts need to be made... end of story! As an Ontario patient, you have no other choice - this is HoskinScare TM for you - - - thanks Dr. Eric! And: isn't it sadly funny, how Metroland writer Chris Malette didn't even mention the words Kathleen Wynne, Liberal, or Eric Hoskins, in his story!! It's as if... let's see... oh yeah: it's as if Liberals have NOTHING TO DO WITH IT !!! Wow!! Nice 'reporting' - anyone reading this half-story would never know that any Liberal, had anything to do with these health care cuts!!! Amazing!!! Here's Belleville's MPP, Progressive Conservative Todd Smith, speaking about the QHC cuts - isn't it funny that Metroland Media reporter Malette didn't even ask the local MPP for an interview!!! "Fall is in the air and because it is, that can only mean one thing: Another round of cuts and staff uncertainty at Quinte Healthcare hospitals. To make up for an $11.5-million funding shortfall created largely because Ontario’s Liberal government can’t manage money, jobs and services will be cut at hospitals in Picton, Belleville, Bancroft and Trenton. Money is being spent on debt that people in Prince Edward–Hastings want spent on the services they need in their hospitals. During the years of this government, QHC has been the recipient of almost continual funding shortfalls from the ministry. Speaker, if I could, I’d like to direct some comments directly to my constituency back at home: The deficit this government is running is costing you your health care services. QHC has had to come up $25 million in cuts over four years to make up for funding shortfalls because the Liberal government at Queen’s Park doesn’t have any money left. The government says money is going into better home care services but the Auditor General says services are being cut there too to pay for fat-cat salaries. The third largest expense in the budget is how much we pay to service our debt and it’s also the fastest growing. That’s why cuts like this have gone from being rare to happening annually." Yet if one reads only Malette's Metroland Media 'report', one would think - as residents of Niagara were similarly conditioned to believe by their local media - that it was just the board of the local hospital who made all these 'decisions'! The link to the Ontario Liberal government's monopolist diktat of health-care cuts is not clearly made, at all!! This is Liberal healthcare duplicity, in its finest most despotic mode. Let's note again - before Liberal monopoly-supporting, single-payer-defending sycophants start deflecting blame onto the QHC - that the blame squarely belongs to Kathleen Wynne's health-cutting, monopoly-pushing Liberals. As similarly happened in Niagara, the NHS and the NHS's CEO were conveniently targeted as scapegoats for implementing what were purely Liberal-mandated monopolist health-care cuts. In Niagara, local Liberal MPP Jim Bradley sat back and smiled contentedly as the local media spun blame onto the NHS, while all along it was his Ontario Liberal government which created the phony budgets in order to manipulate the health-care cuts. Remember the meme: health care cuts are 'good' when Ontario's monopolist Liberals or the NDP do it! “What is an expert? Some say it is a person outstanding in his field. He may be so far out in his field, so far removed from reality, that he cannot make wise decisions. There are no experts - only people with opinions, often biased in their beliefs. Dr. Jack Kitts may be a good doctor but it is clear that he is not qualified to make judgements on urban or municipal planning, demographics, business administration, human resources, or, for that matter, on human rights. All weigh heavily on the operation of our health services. He has rubber stamped, the Sevenpifer, Shragge, Souter plan with only one meaningless minor change. As it stands we will lose our hospital. The NHS information flyer sent out to all homes to convince people that their "improvement plan" will benefit all Niagarans, is riddled with holes. They claim that 95 per cent of all emergency visits at Fort Erie and Port Colborne are not emergencies. Would the percentages not be the same for the larger hospitals? And who knows how many of those DMH visits could become major problems if not examined by a qualified doctor. Their plan would require ambulance attendants to determine the severity of a case and where patients will go, by passing DMH and Port. One of their statements, if this was not such a critical issue, would be laughable. They say that in the event that the QEW is closed due to a severe storm "ambulances would still be allowed to travel on the highway" or "alternative routes" could be used. Which routes? A "lake effect storm" blocks all roads in the southern tier. The whole NHS proposal is an example of poor planning and weak arguments. It is ill conceived and will have horrendous consequence down the line, if implemented. We have been asked to pay a premium for "timely care" which we are about to lose. The provincial government cannot sidestep on this issue. Try as they might, the McGuinty Liberals, through their Commitment to the Future of Medicare Act, cannot side-step the fact that they are completely responsible for their single-minded adherence to their failing single-payer health-care monopoly. Will St. Catharines Liberal MPP, Transportation Minister, and health-care monopolist Jim Bradley answer which 'alternative routes' emergency patients will use during a snowstorm to get from the outer reaches of Niagara to the proposed $600 million regional hospital in St. Catharines? Will Transportation Minister Jim Bradley guarantee that Fort Erie/Port Colborne patients affected by the NHS’s HIP will be able to access hospital services some 30-40 kms away in a timely manner? “The first time someone dies because they cannot get to an emergency room within the critical period of time there will be a lawsuit directed at those responsible for the plan,” writes Davies. Think that Jim Bradley’s Liberals care about that?! Do you think Bradley's Liberals really concern themselves if patients are harmed or die because the Liberals moved their bait-and-switch health monopoly's facilities to another city?! The Liberals have already decided to take their chances to gamble with patient safety, clinging to their failing monopolist ideology rather than give patients payer/provider health-care choice. Did the Liberals tell anyone in the last election that to obtain government-run universal health care you’ll need a lawyer to file lawsuits? What good is that after the fact, anyway - finding out too late that the health-monopoly in Ontario, a racket run by the Ontario Liberals, made tempting illusory claims about providing universal health-care, and then, failed to provide it when you needed it?? We will be told that “No one is to blame”. No one is responsible in a socialist system: that’s the cruel beauty of it. We will be solemnly told that “The System” is to blame, and the Liberal politician puppet-masters running Ontario’s no-choice health-care monopoly will be held harmless from prosecution. Their personal health-care negligence, instituted through their monopolist legislation, will be white-washed. This is why there already is a lawsuit (see: Canadian health-care: go wait in line and die if necessary) against McGuinty’s Liberal-run health monopoly, launched by Ontarians Mr. Lindsay McCreith and Ms. Shona Holmes; it’s a constitutional challenge to the McGuinty Liberal’s ideological (and harmful) implementation of monopoly, no-choice health care. "Ontario’s ombudsman has received two complaints about the Niagara Health System’s restructuring plans, but the government oversight body isn’t saying what the complaints are. Nor is the ombudsman’s office saying who made the complaints. Williamson said the complaints were directed at the Hamilton Niagara Haldimand Brant Local Health Integration Network (LHIN) rather than the NHS itself. Williamson said the ombudsman has no authority to investigate hospitals, but can investigate a Local Health Integration Network because it is a government body. However, she said it is “far too premature” to say the complaints about the NHS plan will be investigated. The NHS restructuring plan has drawn heavy fire from several quarters in Niagara. The plan to move maternity services to St. Catharines as well as turn the emergency rooms in Fort Erie and Port Colborne into prompt-care centres have sparked opposition. The LHIN is currently examining a review of the plan recently completed by Dr. Jack Kitts of Ottawa. Kitts largely endorsed the plan, but recommended the Fort Erie and Port Colborne facilities be 24-hour urgent-care centres. Some vocal critics of the NHS plan, including Fort Erie Mayor Doug Martin and the “hospital improvement plan fight-back” committee at Niagara Falls city hall, denied Friday they were behind the complains made to the ombudsman." It's time that the Liberal's entire health system - the one Smitherman once said we 'didn't have' - went under detailed, independent scrutiny from the Ombudsman's office. It is a good start to look into the LHIN and see what McGuinty's Liberals directed it to do since the Liberals established, appointed and funded this health bureaucracy by passing Bill 36 on Mar.1, 2006. But, further investigation needs to be held into the St. Catharines General Hospital's patient death-rate, which was revealed in a Nov.29, 2007 CIHI study as the third-highest in Canada, and which has never been mentioned or explained by any Liberal since. When Williamson says that the Ombudsman has no authority to investigate hospitals, again, why is this so? It's because Jim Bradley, McGuinty, Smitherman, Caplan, and their Liberal majority Ontario government have decided NOT TO ALLOW the Ombudsman access to their hospitals! The LHIN is also a creature of the Liberal government; Health Minister David Caplan can at any time override anything the LHIN does! The Liberals could ask for an investigation into the NHS immediately! If the Liberals appointed a supervisor to run the NHS, then the ombudsman COULD investigate the NHS's hospitals as well. It is patently obvious that this IS NOT what the Liberals want to do. It's been nearly a year since CIHI's mortality-rate report was released, yet Jim Bradley did NOTHING; he did not even bother to call for an investigation at the time, neither did he bother to provide an explanation himself. Did Jim Bradley, the St. Catharines MPP since 1977, not know what was happening at the St. Catharines General Hospital, in his own riding? Were the CIHI study results a 'surprise' to him? Only a month and a half prior to the CIHI report, Bradley was campaigning in the Oct. 2007 provincial election, smugly pretending that there were no problems in Ontario's, or in Niagara's, health care system! Putting aside the high mortality-rate issue, the Kitts report also noted that the NHS was underfunded, echoing what the NHS itself has said on numerous occasions. Yet, Jim Bradley's odious Liberals simply deny (without providing transparent evidence) that there is any link between the high NHS death-rate, the HIP, and the Liberal's health funding model. The Liberals instituted a multi-billion dollar Health Tax which was supposed to solve all of their monopoly-health-care problems. Where did all that money go? Was it effectively spent? Who really knows? Jim Bradley certainly can't be bothered to answer. Didn't Bradley know that his health care claims were false, even as he was campaigning for re-election? Bradley's secretiveness and subsequent negligence to provide answers regarding his Liberal health-care monopoly's failings are themselves worthy of investigation. What's Bradley hiding - the failure of his ideology; the failure of his statist, single-payer, monopolist status-quo? "Despite my best objections, on March 1, 2006, the McGuinty Liberals rammed Bill 36 through the Ontario Legislature, despite mounting opposition and many pleas for further consultation. Bill 36 has come to be better known as the LHIN (Local Health Integration Networks) legislation. What this legislation does is overhaul Ontario’s entire healthcare system by adding more bureaucracy, centralizing power and hastening the process of privatization. Maybe this is what McGunity and Smitherman had envisioned all along, using your hard earned tax dollars that they raised through the illegal Liberal health tax to hire an army of overpriced bureaucrats and administrators to help make health care services in Ontario less accessible to the average user. And the Liberals won’t even attempt to deny this accusation. Even they estimate that Bill 36 will cost the province in excess of $160 million to administer the newly created LHINs, money that I think could have been better used to offer front line health services. The Liberals claim that LHINs will decentralize the health care system and allow local administrators more local control, and for the Liberals this was the whole point of introducing the legislation in the first place. But a closer look tells you that this Bill will actually centralize power in the hands of the Minister as he has the power to appoint the LHIN board at his complete discretion. And what if the board makes a decision that he doesn’t agree with? No big deal, Bill 36 gives the Minister the power to override any decision that the board makes. I’m not sure how a Liberal appointed LHIN board, people who serve at the pleasure of the Minister, will serve the interest of local control? This is exactly what the PC party, and our leader John Tory has been highlighting over the past few months, “this legislation gives the Health Minister the ability to unilaterally close hospitals, other healthcare services and transfer charitable gifts from one institution to another without any consultation,” states Tory. Liberals claim they are dedicated to preserving public health care, but their actions indicate otherwise. Since the Liberals took office over two years ago they have privatized physiotherapy, chiropractic and optometry services. They are also moving forward with public-private partnerships with the building of new hospitals, something they so vigorously opposed while in opposition. I believe that Bill 36 will only aid the Liberals in their efforts to further privatize many of Ontario’s important health care services. Despite McGunity’s and Smitherman’s best efforts to confuse and mislead you into believing that LHINs will promote local control and improve the service that Ontarian’s receive from their health care providers, don’t be fooled. How can legislation that centralizes power and strengthens the Minister really be about local control? What I think should have happened is the Liberals should have listened to the objections of those who work in the health care profession and scraped this legislation a long time ago. I rejected similar proposals when I was the Minister of Health and that is exactly what Smitherman should have done too!" When Wilson wrote (above) that "Liberals claim they are dedicated to preserving public healthcare, but their actions indicate otherwise", that is an observation describing classic Liberal Healthcare Duplicity. "This Liberal health-care monopoly charade just keeps on getting worse. Liberals like Craitor keep on spitting into the wind with their ‘Potemkin-village’ calls for some half-assed “operational” review of the NHS. The problem here is one of trust and accountability: there is none. (which is why the NHS, as of Nov.12, 2008, has a new facilitator/advisor", Dr. Chris Carruthers, to try to deal with the NHS's Medical Staff Association which passed a motion expressing non-confidence in the management of the NHS) This Liberal-run health system has no competition, no checks, no balances. We have no idea about the cost-effectiveness or appropriateness of any random Liberal health-care funding allocation. We just have to take their word for it, and accept what's handed out to us: legally, we have no alternatives. The Liberals, in my opinion, can’t be trusted as the sole-distributors of health-care in Ontario, simply because they are held-harmless and unaccountable for the blow-back to patients caused by their Liberal health care duplicity. No criminal or civil charges will hold anyone to blame. The Liberals view their re-election as a pass to wreak more monopoly havoc upon Ontario patients. The Liberals believe only they have a divine right to spend the some-38 billion dollars of our health-care tax money." Well, we've now seen this 'operational review' to 'review of reviews' to 'HIP' to 'Kitts report' political smoke-screen eat up almost an entire year. Now, a possible Ombudsman's look into the sacrificial-by-design LHIN will take what, another year? ; that could and should lead into an investigation of the NHS itself; and then, before the heat gets too hot and Liberal politicians start being asked serious questions about how they ran their health-monopoly, an election will come along and it'll be time for Jim Bradley to retire. The smug Liberals will in the meantime stoically protect themselves by deflecting criticism to their sacrificial LHIN - as, of course, was the plan all along. Hopefully, the McCreith/Holmes constitutional court challenge (see: Another Canadian patient forced to U.S. for treatment due to long Ontario wait lists) against McGuinty's health-care monopoly will be handed down before then, exposing the Liberal's authoritarian ideology. But, that should not stop the Ombudsman from fully investigating and revealing what the Liberals have done to the health-care system in their trust since 2003. "A plan to transform emergency departments in Fort Erie and Port Colborne into 24-hour urgent care centres is "destined to fail," says a local physician. "Doctors are not going to want to work (in the urgent care centre)," said Dr. Jeffrey Remington, a Port Colborne physician and ER doctor. "It's not going to work." On Oct. 28 Dr. Jack Kitts made his recommendations on a contentious restructuring plan released by the Niagara Health System in July. Kitts recommended emergency rooms in Fort Erie and Port Colborne keep around the clock service, but as urgent care centres, not emergency rooms. Remington, a member of a family health organization at the Mapleview Medical Clinic, has worked in Port Colborne's ER for several of years, it's an essential part of his job, he said. Emergency room doctors are prepared to handle all levels of patients. Remington explains physicians are drawn to emergency medicine as a specialty due to an interest in working under pressure and makine split-second, life-saving decisions. Acute care facilities, by design, do not include those elements. It also creates satisfaction knowing a life was saved, said Remington, which makes emergency medicine worth practising. "Trained ER physicians may not want to work in an urgent care centre," said Remington. "It's a whole different level of care." Patients with minor injuries and illnesses will be treated in urgent care centres. "The critically ill will go to the hospital most capable of handling them," which could be Niagara Falls, St. Catharines or Welland, said Dr. Bill Shragge, NHS chief of staff. 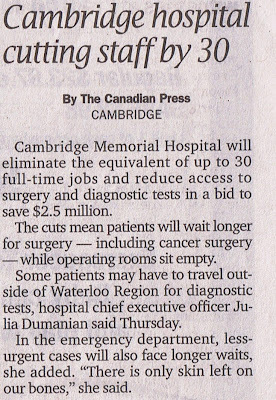 "But 90 to 95 per cent of the people using those emergency rooms will use the urgent care centre." Shragge said the NHS hopes the same doctors staffing the ER will staff the new urgent care centre. The job, he said, will essentially be the same, as 97 per cent of emergency room users in both communities don't have critical conditions. Doctors working in emergency rooms in Fort Erie and Port Colborne are paid through an alternative funding agreement. The agreements were signed last year and took the responsibility of emergency room doctor wages off the Niagara Health System's hands. Doctors are now paid on an hourly basis directly by the province. Shragge said the NHS is in talks with the province to continue using an alternative funding agreement for the urgent care centre. Ministry spokesman Andrew Morrison said there is no universal definition of urgent care. He said it is a term used for a number of facilities across the province. In most facilities, Morrison said, physicians bill Ontario Health Insurance Plan for service. Morrison said he is unaware of any urgent care centres under an alternative funding agreement. If the NHS is unable to work out an agreement with the ministry, and billing goes back to a per-patient system, Remington said the NHS will have a hard time staffing the centre. After midnight, when patient volumes are at a daily low, about one patient per hour, Remington said physicians will be unwilling to work in the unit. "It's not worth a doctor's time," he said. "And (the NHS) going to have a hard time staffing it." What worries Kim Scher, a Fort Erie physician and emergency room doctor at Douglas Memorial, is the loss of emergency nurses. "A lot of our emergencies in Fort Erie are walk-ins," said Scher. "If we have a real emergency and nurses who aren't trained in emergency medicine, we have a real problem on our hands." When commenting on the NHS plan, Kitts suggested patients were getting sub-standard care at the two south-end ERs when he said, due to a lack of equipment and specialists, residents were better off being treated in one of the larger sites. Remington said those comments are an insult to small hospital emergency rooms across the province. "We take good care of our patients in Port Colborne," he said. "If it's serious, we stabilize and we transfer - that's the job." That's the case for many rural hospitals in Ontario, said Ray Dawes, chair of the Ontario Medical Association's section on rural practice. "Most rural hospital emergency rooms are the same as Fort Erie and Port Colborne," said Dawes, who is also chief of staff at St. Francis Memorial Hospital in Barry's Bay, a community with a population of 4,300. "Of the nine small hospitals in (the area surrounding Barry's Bay), two have CT scans." Dawes is concerned that the transformation from emergency department to urgent care centre will reduce quality of care, not improve it as the NHS indicates. "These departments aren't going to operate in the same manner as an emergency department," he said. Dawes said he sees the system failing in Niagara. "Financially, this plan is just not going to work," he said. "There will be a price to pay for people having to take a longer trip for care." Paramedics, said Dawes, will not be a replacement for doctors. Shragge however, maintains the plan put forward by the NHS will improve health care for Niagarans. He said less than five per cent of current emergency room users in both communities are critical." "The system is failing in Niagara" says Dawes: yet Liberal MPP Jim Bradley, the health-care monopolist, says nothing. Jim Bradley has said nothing at all yet about the Kitts NHS HIP report - which was delivered to the LHIN over two weeks ago! Of course "there will be a price to pay" for Liberal Healthcare Duplicity: This is the cost of Jim Bradley's arrogant Liberal ideology.